To order anything pictured here, please preferably email us using the link above, or telephone us. We can then reply with bank BSB and account details for an internet transfer, or you can post us a cheque or money order. We can also more accurately combine and calculate the postage charges for you, once we know what you'd like! 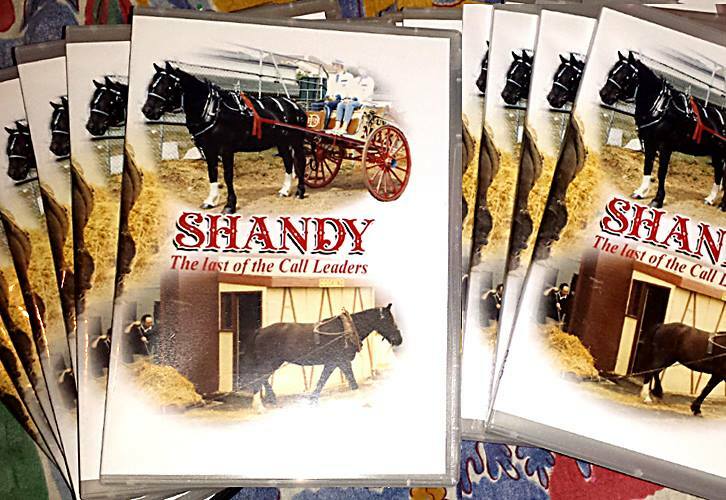 'Shandy DVD' "Shandy: The last of the Call Leaders" - this 1 hour 10 minute DVD is finally out! 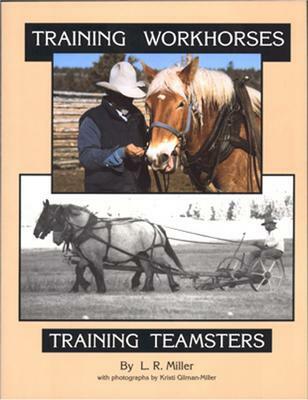 It tells a brief story of how Tim Peel broke-in and trained Shandy, a draught mare who lived to the very ripe age of 37, passing away in the year 2000. 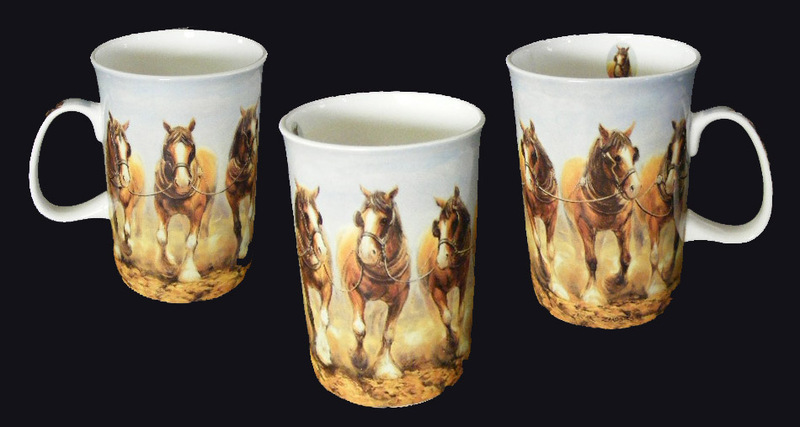 The video features explanations and demonstrations of how Shandy can be driven as a 'Call Leader', entirely by voice command-no reins used at all in either the slide or the tip dray. There is fairly extensive commentary on harnessing up and assorted other useful information, and it is all supported with captions or subtitles to help emphasise important points throughout the video. 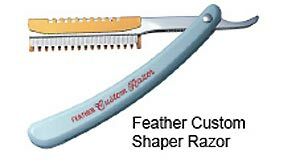 This special Feather Razor (TM), ideal for plucking and preparing feather-legged horses such as Shires and Clydesdales. 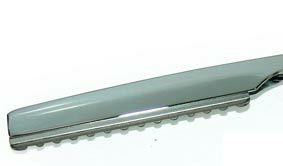 The special thinning blades d have a reputation as being the worlds longest lasting blades. They do a terrific 'non razored' looking job. 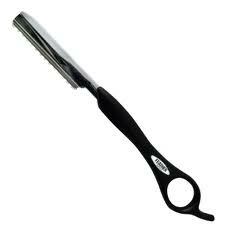 This deal with 11 blades is enough to last a good many many years of plucking and preparing horse feather! We have the very popular 'rope' halters with the crown knot under the jaw. These are made with 3000 kg breaking-strain 8mm marine-grade braided rope. We also have 1.8 metre lead ropes in 20mm braided marine rope of 5000 kg rating, available as a permanent attachment to the halter, or available with a large 'bull' snap clip. We have not yet known one of these snap clips to break. 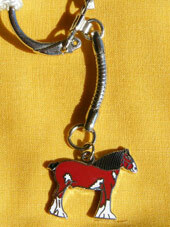 Clydesdale foal size halter $18.50. 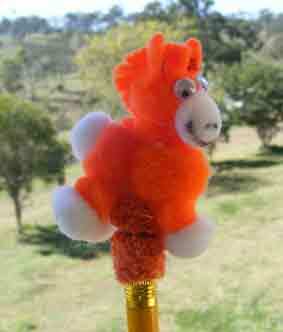 Weight 900 grams for one halter. "Enthralled" is an appropriate title for this new book just published in mid 2015 by John Young. 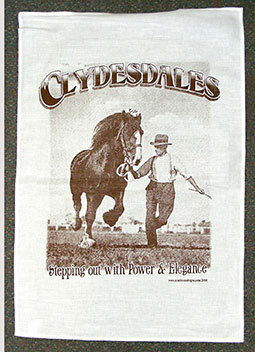 For Clydesdale history enthusiasts, there is not one better. 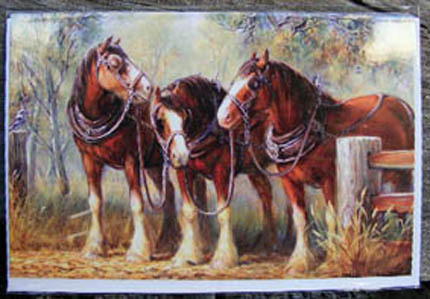 It contains a COMPLETE reprint of the great book by James Kilpatrick called "My Seventy Years With Clydesdales" printed in 1949 on Scotland. As well, it includes a complete transcript of Wm Dunlop's famous 'Mingavie address' given to the members of the Clydesdale Horse Society of GB & I in 1935. This speech went for many hours and even the abridged version when printed in the Scottish Farmer newspaper took up many pages in very fine print. This book contains the entire speech/memoirs typed from the original draft that Dunlop handed to John Young's grandfather after he'd stepped down from the podium that night. $32.00 Postage is $8.50 interstate, or $8.50 to a Qld address for one copy, or $16 interstate or $14.00 in Qld for 2 or more copies sent together in a 3 kg prepaid satchel. 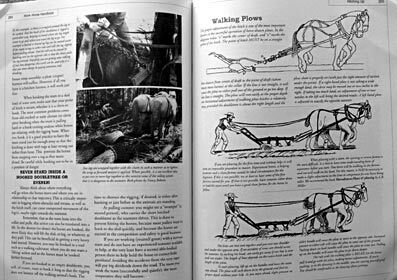 "Jinkers and Whims" is a terrific book by Jack Bradshaw all about the logging industry in West Australia. If you like really detailed picture books, or great text, or both, this is a must-have. 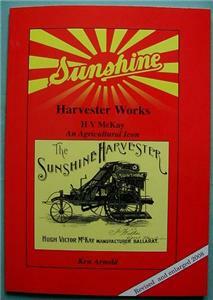 Jack spent most of his working life working for the WA Dept of Agriculture, and after retirement he researched and assembled this great 'pictorial essay' of about 150 years of Aussie logging & timber history. or $14.00 post inside Qld, for a 1kg pack. 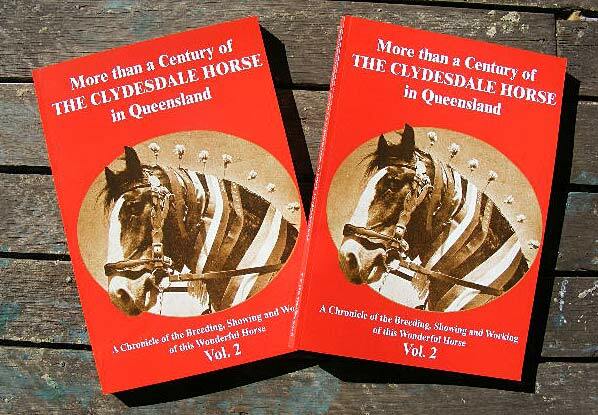 "More than a Century of the Clydesdale in Qld - vol. 2" , publ. by the CCHS Qld Branch, July. 2009. Containing 15 chapters, 288 pages, over 600 pictures, with stories, technical information, statistics, and more. A4-size. 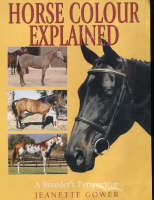 "Horse Colour Explained" signed by Australian author Jeanette Gower. 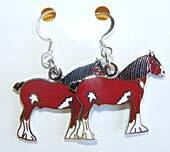 following on from the 'Clydesdales' book (listed below) this book includes information on Suffolk Punches, Shires, Clydesdales, Australian Draughts and Percherons and many Australians involved with these great horses. 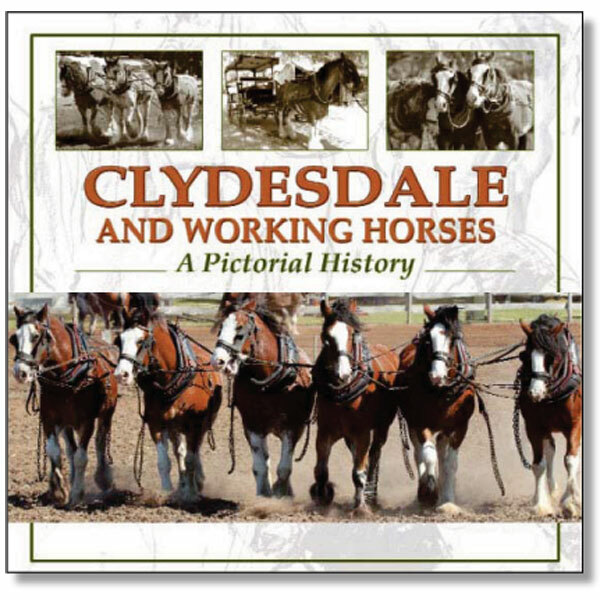 "Clydesdale and Working Horses-A Pictorial History,"
134 pages, full colour & black & white, plenty of pictures and assorted stories of some well-known identities in the heavy horse industry. 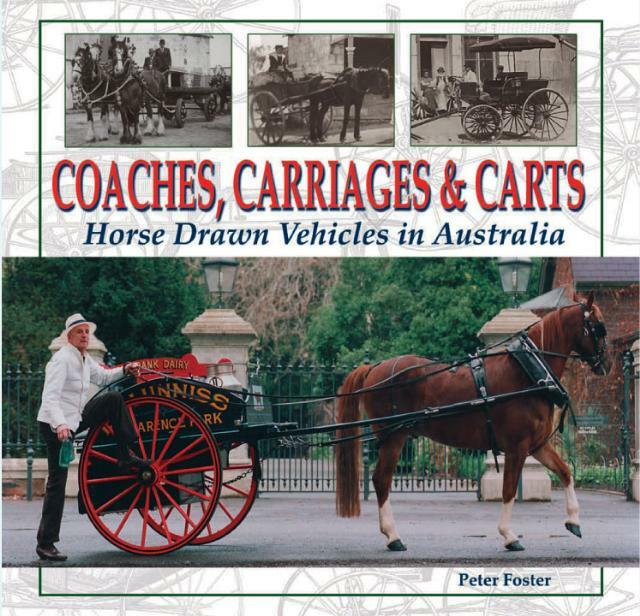 138 pages, hard cover, full colour,full of good photographs and pictures-this is a very useful and interesting reference book for those interested in Australian horse drawn vehicles and the associated trades.. 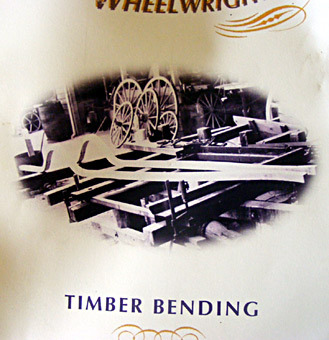 The Secrets of Wheelwrighting - Timber Bending. 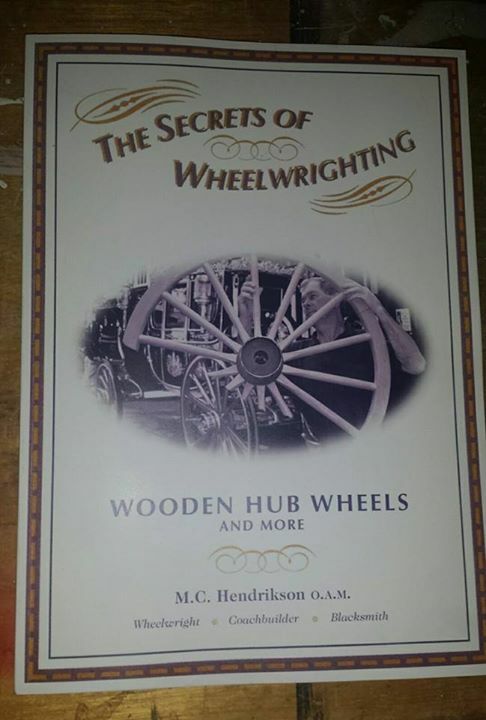 This is the second book by Mike Hendrickson, written in his usual conversational style, and it details many lessons, tips and ideas he has learned over many years of setting up and running a business involving steam bending timber to make parts for horse drawn vehicles as well as for architectural features. 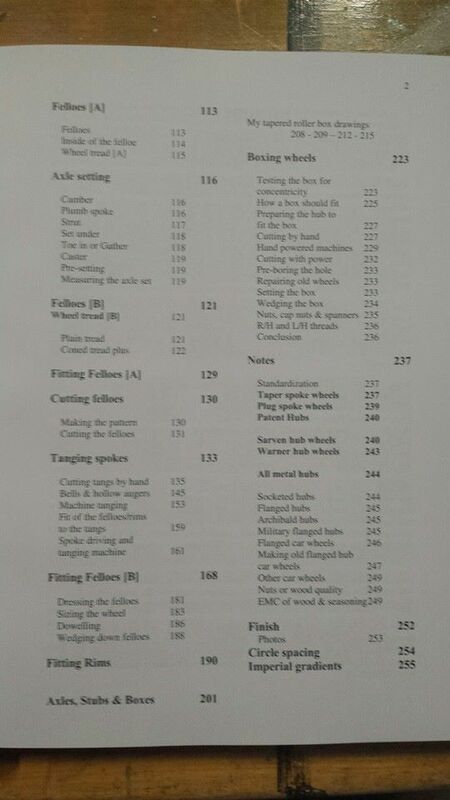 If you are interested in the subject of 'steam' bending timber, this book is worth reading! 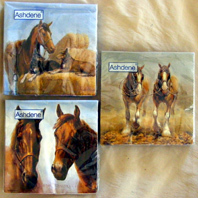 please enquire re weight & postage costs and what can be combined with what. 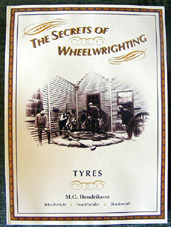 The Secrets of Wheelwrighting - Tyres. 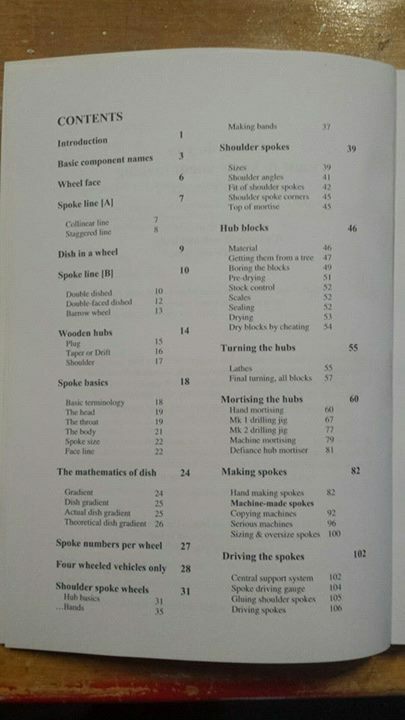 This is the original but revised book by Mike Hendrickson, written in a very conversational style, explaining many intricacies of assembling wheels, but mainly the fitting of tyres. 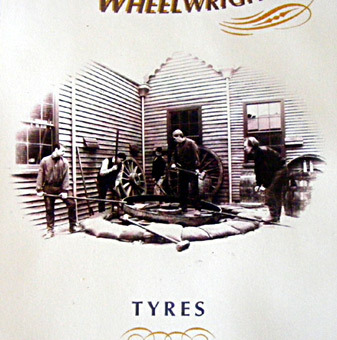 At the back is a chapter on using a rubber-tyring machine, as well as the setting up of the West's Patent Cold Tyre Setting machine which now operates at Sovereign Hill, Vic. 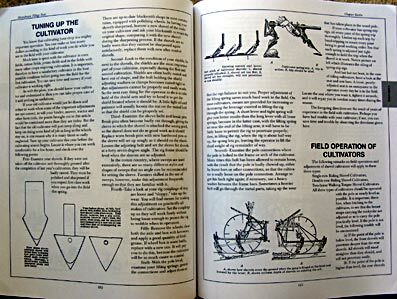 If you are interested in wheelwrighting, it is a book worth having! They are a good complementary pair, together. 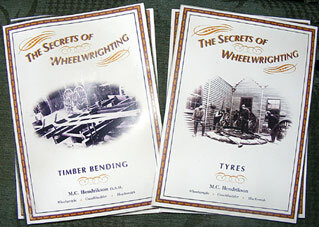 Or buy both Bending & Tyres books for $66.00 the pair + post. Both these books are very hard to source, and this one has been in demand for a long time. This new book covers wheel construction using historical mass-production machinery, modern high-end workshop machinery, and also with hobbyist or typical home workshop equipment. 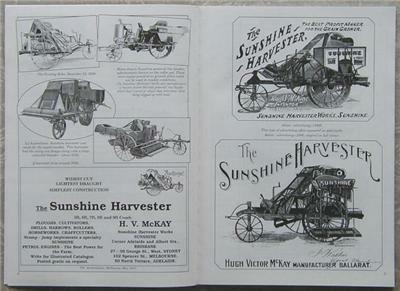 It also covers wooden spoked car wheels, and fills in the information voids to complement the other two books above. Nobody in the world stocks and sells these three books as cheaply as we do! 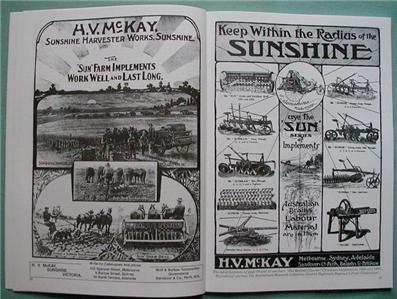 This book is a most useful handbook,with hundreds of photos and drawings, the profusely illustrated text covers restoration, rebuilding, repair, and tuneup with a focus on the very popular McCormick Deering (International) No. 9. 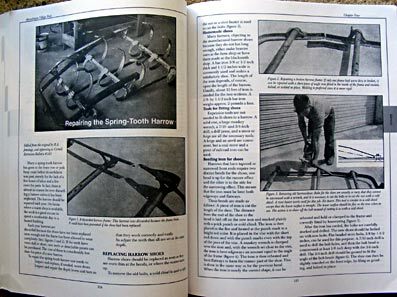 It also includes references to many other makes and models as well as resource information for updating cutter bar assemblies to new materials and functions. a big weighty book of 352 A4-sized pages! 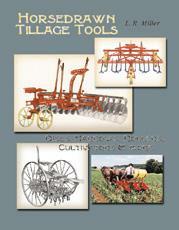 The Ploughing book by Lynn Miller. 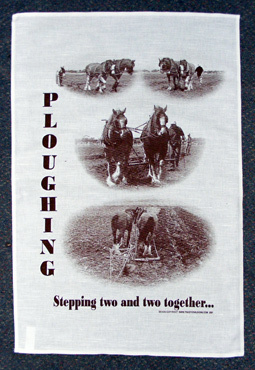 with over 1,000 drawings and photos covering how to plough with horses using older equipment and new implements. 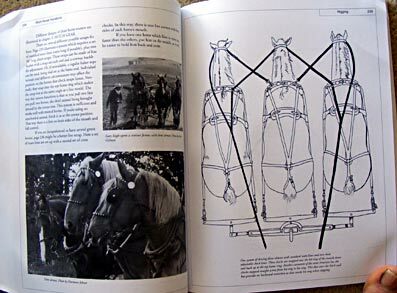 In it are simple diagrams explaining tricky adjustments for both riding and walking ploughs. 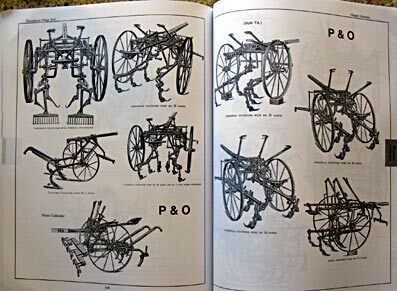 Detailed engineer's drawings of John Deere, Oliver, McCormick Deering, Parlin and Orendorff, Avery, and many other older manufacturers will be immensly helpful to folks restoring equipment. 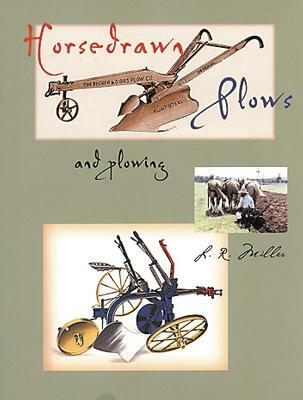 Also includes closeup photos and information on new makes of animal-drawn ploughs including Pioneer and White Horse. NEW ones are about to arrive soon -it's been out of print for over a year. 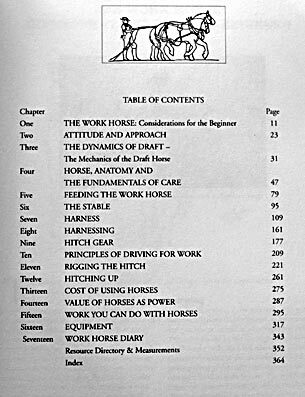 The Work Horse Handbook, by Lynn Miller. NEW second edition! . 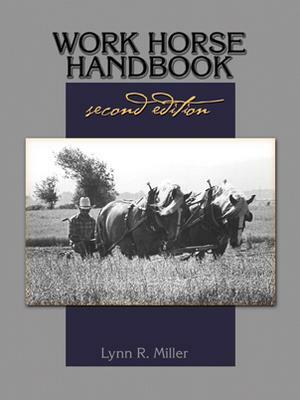 The original has become a classic and THE standard reference on working horses in north America. 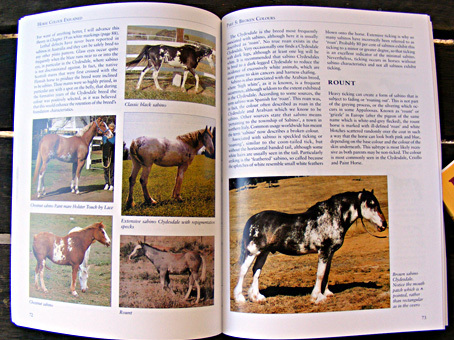 The second edition expands that reputation with hundreds of new drawings and photographs to illustrate the expanded text. 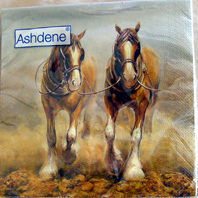 From care and feeding through harnessing (which they call 'hitching') and driving: every aspect is covered. 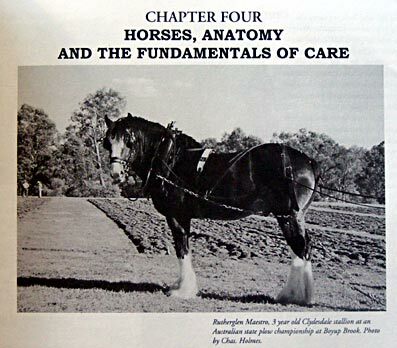 New subjects and material include; extensive equipment coverage including forecart advances, synthetic harnesses, new american harnessing apparatus, additional training and procedural information, care and feeding additions, additional breeds coverage, plus an expansive source directory. 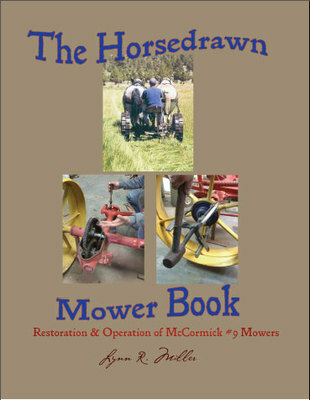 Find out for yourself why this American book is considered by thousands to be THE volume on working horses in harness. 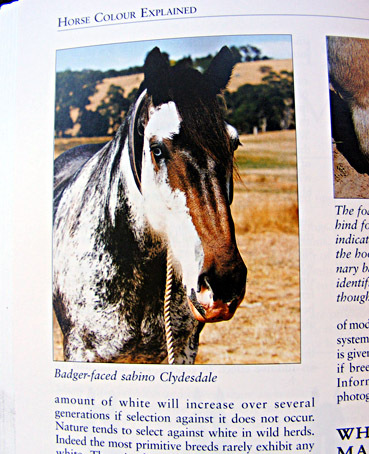 Plenty of practical information is relevant to Australia, also. 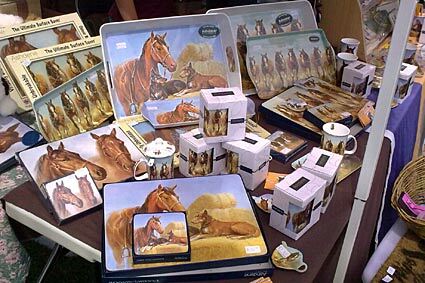 Many, many more in stock, not pictured- see Aussie Heavy Horses on Facebook for updates- about 20 designs! 1. 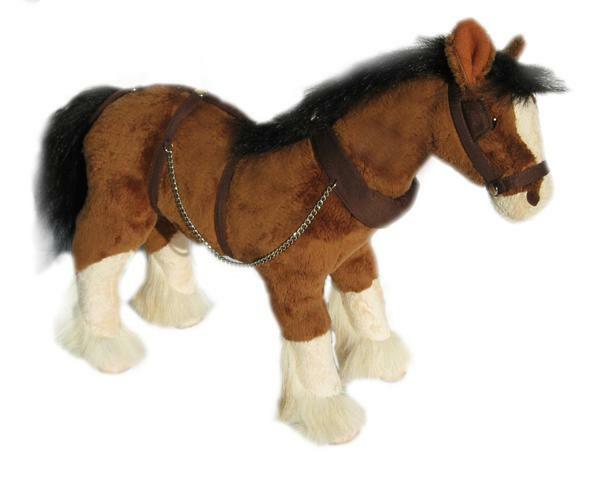 "Working Clyde", 7 inch (17.5 cm) standing, with collar & winkers. Bay. 2. 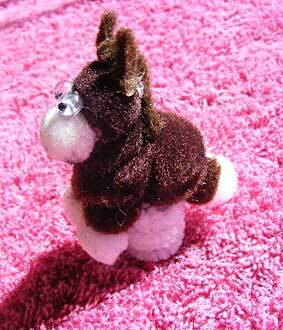 Bigger "Rimsky", 15" (38 cm) standing horse as above. Brown. 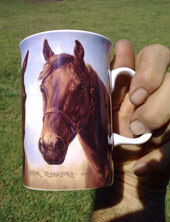 He IS big, and has been a consistent favourite. 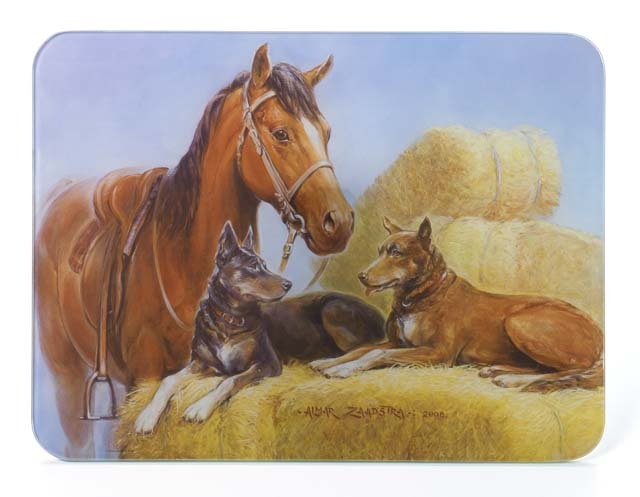 Serviettes/Paper Napkins - packs of 20 We have two designs of paper napkins or serviettes-the Working Partners, and the Magnificent Horses team of five clydesdales-13" or 33cm square, unfolded. 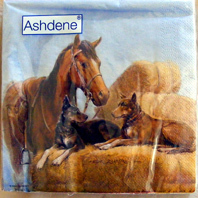 $6.50 per pack of 20 horse serviettes very light-please enquire. 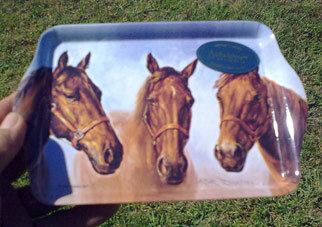 Also the 3-piece Tea Infuser set with a lid-currently only in the Magnificent Horses team design. and it holds four. .
only. 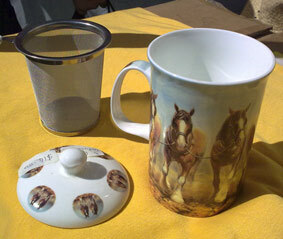 $12.50 38 cm x 16.5 cm. 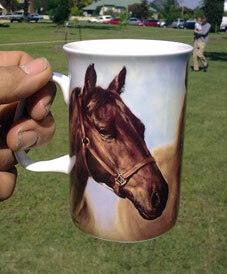 Please enquire: New stock in-photos to be uploaded. 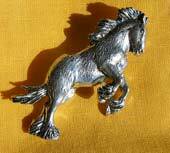 Cast resin saddle horses or harness horses as fridge magnets. 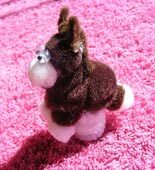 They are about 10cm long, with a very strong magnet, and come in a buckskin, bay or dark brown colour $4.50 each Please enquire-possibly $2.10 for one or for two. 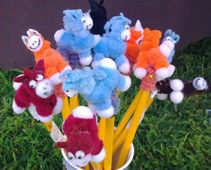 Novelty horse made of pompoms, attached to a pencil- kids love these! All colours available. 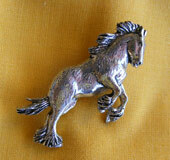 A very detailled pewter draught horse brooch with a sturdy clasp, it is about 4 cm long. 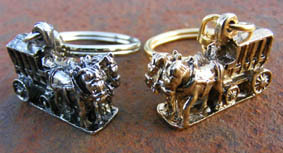 carved 3D horse figures & lettering, gilded (gold-leaf) vee-grooved or incised signage, airbrushing, or ordinary painted or computer-cut lettering on flat aluminium-composite sheeting or steel. We are also happy to just supply cut-out vinyl lettering for you to apply to your vehicle. 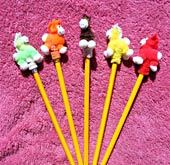 individual collection, Australia Post, or courier, as required. We have sent signs all over Qld & NSW. To order anything pictured here, please preferably email us using the blue link (right), or telephone us. 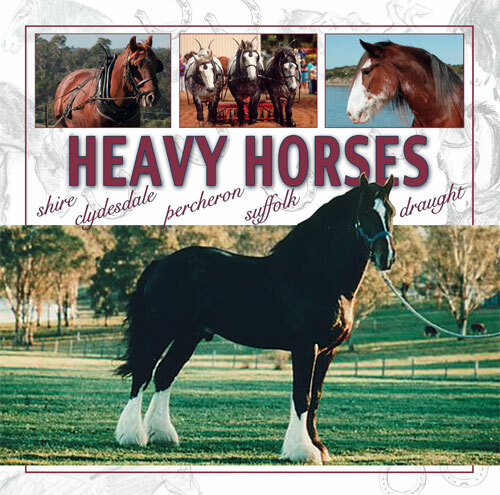 Aussie Heavy Horses, "Highgrove", Peranga. Qld 4352. Australia.